Fort Knox encompasses 109,000 acres and is a certified Kentucky city and the sixth largest urban community in the Commonwealth. The surrounding communities house hundreds of military retirees and active duty families. 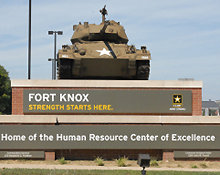 As the Army’s Human Resource Center of Excellence, Fort Knox is now positioned to continue its central role in the front ranks of military installations in the US, recruiting, training and supporting warfighters for the challenges of the twenty-first century. The HR Center of Excellence is responsible for all Soldier career management, from swearing in to departing service.